In this .gif you can see the inner structure of the print, this is called the infill. Infill is generated by the slicing program you use. You can set the percentage infill you want and choose from different pattern options. 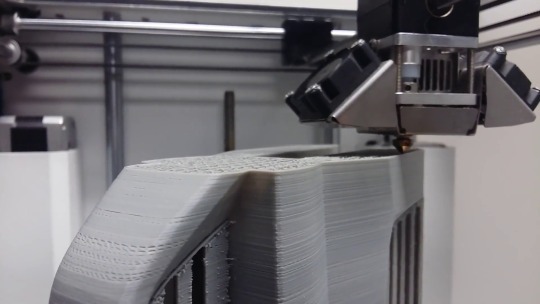 You could use 100% infill on your print but it would use a lot of material, take a lot of time and weigh a lot more, so 100% is rarely (if ever) used. Even 50% can be a bit much for most prints! 10-20% is usually more than enough. You can also see a bit of a print error on the left side, there is a bit of separation between the layers. This was caused by the nozzle speed was too fast and the resolution was set too high. In this case it was mostly an aesthetic issue and could be fixed by filling the gaps and sanding it smooth.